A rally in favour of Imagine for Margo and the research against child cancer. 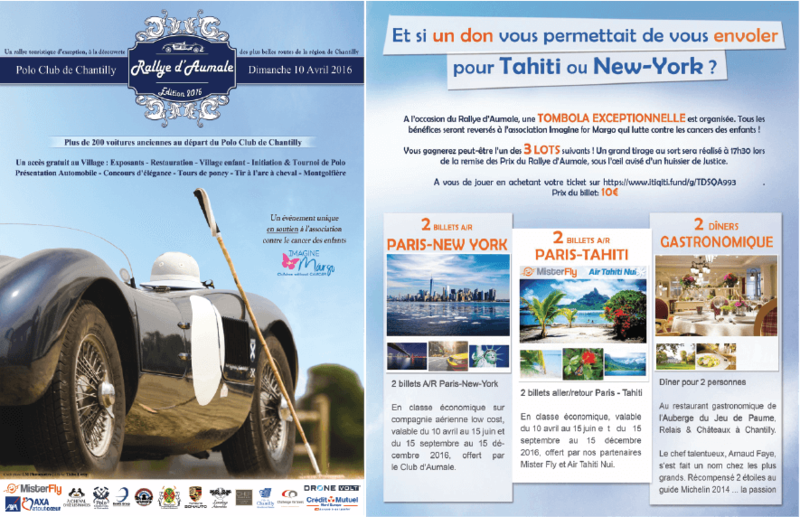 Fly to Tahiti or New York ! Join our big random draw to the benefit of Imagine for Margo and give yourself a chance to win one of three special gifts into play with our partner MisterFly ! ● Go on bit.ly/1Za32Pn to participate ! Random draw Sunday, 10th of April at the “Rallye d’Aumale”. Do you will be one of the lucky winners? Un “village départ” accessible FOR FREE for everybody and plenty of exceptional entertainment!